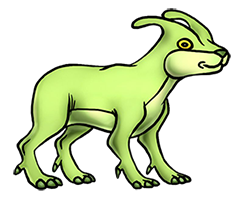 This small, common herbivorous Kreature is constantly alert and has quick reflexes because its wild ancestors were prey for many predatory Kreatures. It prefers to live in habitats with tall foliage where it can hide. It can disguise its scent, so when it finds a hiding place it can be very difficult to track down. It is unexpectedly noisy for a Kreature of its size, making loud calls to attract a mate, using the hollow crests on its head as resonating chambers. Kastan’s mix of small prehistoric horse and hadrosaur dinosaur with the crests once again make a simple yet effective design.